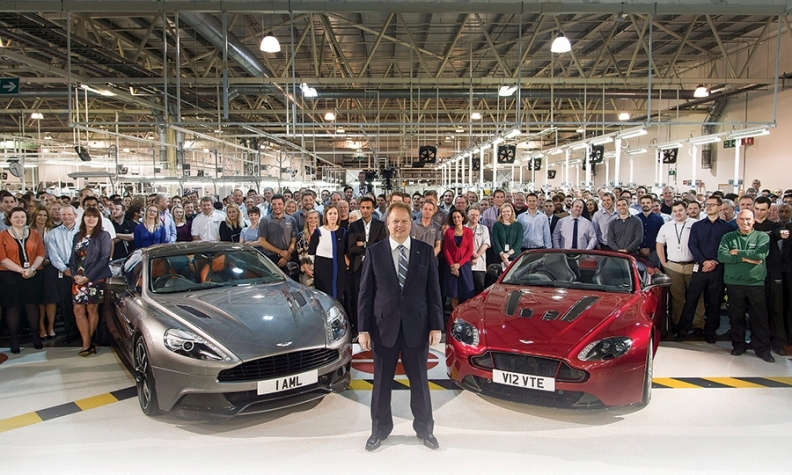 Andy Palmer with Aston Martin employees, a Vanquish Coupe, left, and V12 Vantage S Roadster. Charlotte, an affluent Californian in her late 30s, is the new target buyer for British luxury brand Aston Martin. Charlotte wants a people- and cargo-hauling crossover -- not the low-slung sports cars Aston makes today. And a crossover she'll get, says Aston CEO Andy Palmer. A five-door crossover, a lineup of redesigned sports cars and a new sedan are part of Aston's plan to boost global volume. Increasing volume is key to Palmer's goal of making Aston profitable and able to fund new product development. Palmer figures that female buyers and a crossover will help expand Aston's reach. "The logic is simple. We sold 70,000 cars in 102 years -- less than half left the U.K., 3,500 were to women and 2,000 to the emerging markets," said Palmer, a Brit who took the helm in October after a stint as Nissan Motor Corp.'s chief planning officer. Palmer is targeting 7,000 global sales, excluding the DBX crossover or the new Lagonda sedan. How high might sales go with those vehicles? Aston's factory in Gaydon, England, can build 10,000 vehicles on two shifts and 15,000 on three, he said. Last month, the Financial Times reported that Aston was considering U.S. production of the crossover. That vehicle will appeal to the fictional Charlotte, who wants to sit up high and "wants that shell of safety and needs flexibility and room for the children," Palmer said. The crossover not only will open Aston to a new segment and new customers but will appeal to the Asian market that has shunned the brand, he said. "You can be the No. 2, 3 or 4 of a major car company and be forgotten five years after you retire. Or, you can be the CEO and write a little bit of history." It's an ambitious plan for a brand that has been bankrupt several times, saved each time by an infusion of cash from a new investor or owner. "Aston has been starved for investment for some time. That has changed with Andy's arrival," said James Walker, owner of Aston Martin Washington DC and chairman of Aston's U.S. dealer advisory board. "There is a planned rhythm or cadence -- we will have new products regularly. Andy is committed to doing all he can to freshen the current product line, and he has showed us a five-year vision." Aston has 37 U.S. dealerships and 155 worldwide. Last year it sold about 4,000 cars worldwide. The company would not disclose details or break out U.S. sales. According to IHS Automotive, Aston sold 845 cars in the United States last year, down from 943 in 2013. Ian Fletcher, principal analyst at IHS Automotive in London, forecasts Aston sales will rise to 4,800 vehicles by 2017 and to 6,500 in 2018. "They have been barely keeping their head above water," he said. "Palmer is a good man to have at the helm," Fletcher said. "He understands how a big automaker works and how to direct products." Palmer, an engineering Ph.D., says he wants to put his mark on the small British company -- and, for once, be the boss. Palmer was called a shadow CEO to Carlos Ghosn, the head of Nissan and its French alliance partner, Renault. Of Nissan's nine executive vice presidents, Palmer arguably wielded the widest influence at Nissan, where he worked for 23 years. Palmer, 51, says he left last fall because Ghosn said a Japanese would be the next CEO of Renault-Nissan. "You can be the No. 2, 3 or 4 of a major car company and be forgotten five years after you retire," he said. "Or, you can be the CEO and write a little bit of history." 2 investors own most of Aston Martin. Palmer has moved fast. By the end of January, the board approved the product plan that Palmer says guarantees Aston will return to profitability. He said Aston didn't make money last year, but could not yet disclose numbers. Aston's two primary shareholders are Investment Dar, a Kuwaiti investment consortium that bought the brand from Ford Motor Co. in 2007, and Investindustrial, an Italian private equity fund that previously owned Ducati motorcycles. The investors put an additional £150 million ($227.6 million) into the existing $758.8 million product plan, Palmer said. Aston announced on Thursday, April 30, that it had raised just more than $300 million in a sale of company stock. The money will be used for development of the DBX crossover "and other new luxury vehicles," Palmer said in a statement. When that plan runs its course, Aston will have sufficient cash flow to invest in more new products, Palmer said, bubbling over with enthusiasm about the brand that's headquartered just five miles from where he went to school. "I have to demonstrate I can hit the profits that I promised," Palmer said. "There has always been an assumption that there would always be a benevolent somebody to put the money in, that there will be injection. That is why you have to change the business model." When Aston hits 7,000 global vehicle sales, it would still have "exclusivity and enough money to regenerate the portfolio -- it works financially," said Palmer, who has been described as a math whiz. "We are just using industry logic. That is enough to ensure exclusivity ... all sorts of things happen to residual value, pricing and demand." Aston will redesign its lineup of sports cars over the next 21/2 years starting next fall. It will use a new platform developed in-house. The crossover, due later in the product plan, will have five doors and awd, rather than three doors like the DBX concept shown at the Geneva auto show. Palmer predicts the crossover will be a strong product in the U.S., competing with entrants such as the Bentley Bentayga that goes on sale next year and a Rolls-Royce crossover two years later. "The sky is the limit with how far you can push that category," said Fletcher, adding the success of the Porsche Macan and Cayenne crossovers illustrate "you do not have to be pigeonholed as a manufacturer." Palmer won't be pinned to a volume for the crossover but notes that Rolls-Royce plans to make at least 2,500 of its as-yet-unnamed vehicle and that Bentley projects that the Bentayga will have volume of 5,000 to 8,000 annually. The Lagonda sedan will compete with chauffeur-driven Rolls-Royce sedans, and "it eventually becomes a serious car," said Palmer. That car comes at the end of the product plan, he said. "Think Rapide stretched for more space in the rear and up high," said Palmer, referring to the sedan as a limited edition of 200 cars in Europe, the Middle East and China -- but not the U.S.
Aston will continue to produce vehicles such as the 12-cylinder Vantage GT12 -- a run of 100 cars selling for $380,850 -- and the $2.3 million 800-hp Vulcan that also debuted at the Geneva auto show -- only 24 will be made for the world. Palmer calls these cars "the future classics" and "provenance cars" that will command millions of dollars at the auction houses. Aston will do two or three special runs a year, he said. "It is the opposite of making money now. It is important to make that money in the future to keep that lineage," he said, adding it helps Aston's image when its cars reap millions at auctions. A common complaint about Astons is that the sports cars look similar. It doesn't help that the Ford Fusion, a relatively inexpensive midsize sedan, has a grille that looks as if it came off an Aston. "The product currently is a little bit stale, and to the general public the V-12 vs. V-8 vs. the DB9 or the Vanquish has a similarity in the interior and exterior design," said Kevin Flanagan, owner of Aston Martin Summit in Summit, N.J. "The cars have been around for a while. There has to be a relevance in an Aston Martin's beauty." Palmer quips about the overly familial look, "It works for Porsche." But he quickly follows outlining his instructions to chief designer Marek Reichman, who has been at Aston since 2005 but also worked for Rover, BMW and Ford Motor Co.
"My brief to Marek is that my 76-year-old mother needs to be able to tell the difference between a Vantage, a Vanquish and a DB," Palmer said. "Plus it has to be instantly recognizable as an Aston Martin." Palmer adds that the blend of continuity and change will extend to the entire company. "It may sound contentious to say Aston Martin is going into crossovers or making low-volume specials. Sometimes that is what you have to do -- that is how we keep our character and our brand and the same time we generate cash."